We are a leading Manufacturer of copper bonded earthing electrodes, grounding electrode, dg set earthing electrode, cbr copper bonded rod, copper bonded grounding electrode and copper claded electrode from Noida, India. JMV is into the manufacturing of high quality Copper Bonded Earthing Electrodes applicable for any electrical installation to protect the equipments and operator against dangerous touch voltage. The technology is evolved as Copper Bonded Pipe-in-Pipe and Strip-in-Pipe technology. JMV offers well manufactured Grounding Electrode consisting primary and secondary electrode with the hollow space filled with a highly conductive compound. Our Chemical Grounding Electrodes are anti-corrosive in nature and comply all the necessary technical parameters. We manufactures earthing electrode system for DG Set which provides low resistance path in ground to any fault & leakage currents, thus ensure long life to the equipment against any kind of threat generated by excessive/fault current generated in the system. The system is corrosion-resistant and much responsive in enrouting low potential path to unwanted current hits. Backed by the rich experience and a competent team of professionals, we are able to offer Copper Bonded Rods (CBR) . The offered range of CBR are widely appreciated among the clients for its quality and durability. JMV manufactured high quality long life Copper Bonded Ground Electrode which are specifically preferred by the customers for the neutral applications of Transformers, Generators, UPS, Servo stabilizers, etc. The Copper Bonded Electrode raise 100-250 microns copper coating and is widely available in different dimensions. JMV is developing Low Impedance Chemical Claded Earthing Electrode especially for locations where the soil resistivity is high and electrical conductivity is poor. The copper coated earthing rods provided by us are designed to provide desired protection from lightning and electric shocks. High tensile strength with 527.3 kg/cm. JMV offers high quality cost effective Copper Bonded Earthing Electrodes provides low resistance path in ground to any faulty/leakage currents and ensures the smooth flow of current. 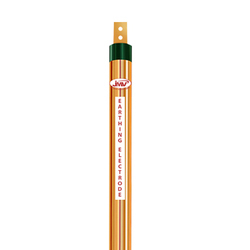 JMV manufactures and delivers earthing electrodes are made of 99.9% copper pipe with centrically placed strip. The hollow space is duly filled with non-corrosive and highly conductive compound which protects the electrode from any corrosion. Looking for Copper Earthing Electrodes ?